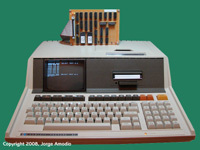 Given that the HP 28292A is one of the hard to find accessories to for the HP Series 80 and it's a must have if you don't have some of the original expansion ROMs such as the Assembler ROM, the primary goal of this project is to design and build a functional clone of the HP 28292A. The first phase is to design an equivalent circuit to the original HP 28292A using off the shelf CMOS/TTL currently available components and build a prototype. 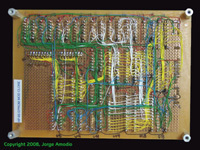 For this phase we will rely on the schematics obtained by reverse engineering and actual HP 82929A module. The second phase will be to gather detailed timing specifications and requirements using the clone prototype as a test bed for the selection of an appropiate microcontroller and basic architecture of a second generation clone prototype. As a replacement for the pair of AM25LS25121 8-bit identity comparators I used a pair of 74ACT521 or you can also use 74LS688 which provide the same function. With the changes mentioned above I put together a first prototype board using standard DIP parts and wirewrap sockets. The end product is shown in the two pictures on the top right of this page. The next step is to connect the prototype board to the HP-85 expansion slot and test if everything works as expected. 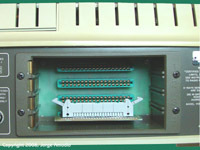 As you may have noticed the prototype board has a 40-pin IDC connector, which is intended to be the connection to the HP-85 expansion slot. I've been thinking and working about different alternatives to connect this prototype board and may be others to come to the HP-85. 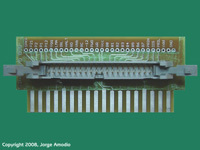 While I was doing some research about the HP-85 bus signal I had one machine with a flat ribbon cable coming out from the cabinet, each wire was soldered directly to the back of one of the expansion slot edge connectors and on the other side terminated on a long male pin header attached to a solderless breadboard. This alternative was cheap and it worked but I was not very comfortable (less having small kids hanging out in my office/lab daily) to leave the wires permanently connected to the guts of the HP-85, and on the other hand I could not move the connection to another machine (I've a small collection of HP Series 80 machines). Just to increase reliability I added pull-up resistors to the data outputs of the EEPROMs. 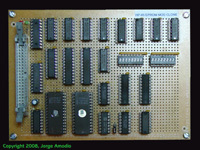 The previous design of an EEPROM board by HP for internal use had pull-ups and a 80C97 three-state buffer that in this design is being substituted by a 74HC244. After correcting the wiring errors and removing the extra load on the RC signal, the thing worked very well, even with a longer flat cable of about 4 feet. I'm not sure yet if I'll invest the time to develop a pcb layout for this version of the clone. The link to the schematics pdf file now points to the corrected version (2.3).